This used 70' Real Ships yacht for sale is super cool and sea-worthy! : Atlantic Yacht & Ship, Inc. This used 70′ Real Ships yacht for sale is super cool and sea-worthy! Brad Nelson brings news that he has listed a deal on a sea-worthy 70′ Real Ships yacht for sale! In the first place, although this yacht was launched in 1995, she had a total refit in 2012. Generally speaking this 70′ Real Ships was designed by Jay Benford Design Group. Then she was fabricated by Custom Steel Boats of Merritt, NC. Custom Steel Boats has been a family-owned business since 1981. As can be seen on this yacht, they are renowned for both commercial and recreational steel construction! Additionally, this 70′ Real Ships enjoyed an 8′ hull extension in 2012 to enhance the hull. In fact, the current owner of 12 years is the owner of a successful marine repair facility. That means she has been maintained by a knowledgeable owner. In summary, this owner knew what to do in order to make this a true “Island Expedition” vessel. This includes the four year refit process that was completed in 2012. In brief, the refit included installation of a 2nd generator & upgraded stabilizers. 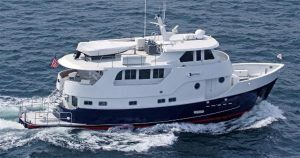 Furthermore a new water-maker, modernized galley, teak floors, and much more. Also, the entire hull and superstructure were painted at that time. This is just the beginning of the features and upgrades on this yacht! For more information on this 70′ Real Ships yacht for sale contact Brad Nelson today! Don’t miss this sea-worthy 70′ Real Ships yacht for sale – now in Fort Lauderdale! Check out this huge used 70′ Real Ships yacht for sale in Florida! Do not miss this deal on a huge 70′ Real Ships yacht for sale in Florida!